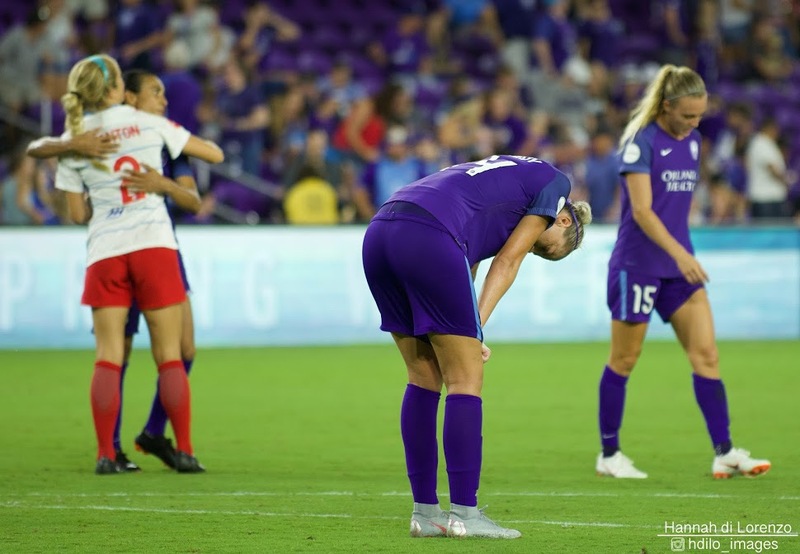 The final nail in the Orlando Pride playoff coffin was firmly hammered in by the Chicago Red Stars on Saturday night in a 3-1 victory at Orlando City Stadium. Along with eliminating the Pride from returning to the playoffs, the Red Stars moved to the brink of becoming the first team ever to get there four consecutive seasons. They need only a draw at home to Sky Blue or away to Utah to qualify. A pair of goals late in the first half staked the Red Stars to a 2-0 lead and they were well on their way, undaunted by the lightning delay of nearly an hour that halted play in the 8th minute. Sam Kerr played a hand in all three goals. In the 44th minute she broke through. Striking quickly after goalkeeper Alyssa Naeher threw it out of her box, the Red Stars moved the ball in to Kerr when Danielle Colaprico drove it upfield and Yuki Nagasato made a single, deft touch to spring her teammate. Kerr was greeted by Shelina Zadorsky who she beat with a cut to her right, and the reigning MVP then beat Ashlyn Harris with a fine finish with the right foot. Harris had previously made a series of quality saves to keep the Pride in it but could do nothing with Kerr’s effort. In the opening minute of stoppage time the Red Stars struck again. Kerr was played down the right this time and was able to play it back to Vanessa DiBernardo roaming unmarked into the box. DiBerardo’s finish put the visitors ahead two goals and put the Pride season in the thinnest of ice. Approaching the hour, Kerr hit the final dagger. The Pride were struggling to get the ball out of their defensive third when Kerr followed Alanna Kennedy into the penalty area in an attempt to circle around Red Stars and get the ball out of danger. But Kerr took the ball from Kennedy and beat Harris to make it 3-0. The goal was Kerr’s 14th of the season to put her in sole possession of the league lead over Lynn Williams who hit her 13th earlier in the day. Alex Morgan pulled one back for the Pride in the 65th, heading in a Marta cross, but the Pride never looked as if they would get back into it, and ultimately went out with a whimper. The Red Stars (8-4-10, 34 pts) next host Sky Blue FC on Tuesday, September 4. Both teams will be down their national team and U-23 players for what will be a makeup of a postponed match from July after a cancelled flight prevented Sky Blue from reaching Chicago on time. The Pride (8-9-6, 30 pts), now in seventh place, also face Sky Blue next in the September 8 season finale in New Jersey. A second half explosion from the Dash, honoring their fans in their home finale by setting a new franchise record for goals scored in one game as well as one season, resulted in the most lopsided win in team history as well as any team this NWSL season. This is also the first time in the history of the NWSL that a team has had six different goalscorers in one game. The first half started out almost evenly, with the Dash seeing more of the ball and spending more time in their attacking half, but Sky Blue had their chances, with Carli Lloyd getting several good chances. Scoring kicked off in the 22nd minute when Kailen Sheridan came charging off her line to make a great block 1v1 with Rachel Daly. However, the rebound spilled right to the feet of Linda Motlhalo, who became the fourth-youngest scorer in NWSL history with her first goal of the year. Sarah Killion came closest to tying it up in the first half when she launched a rocket from distance that forced Jane Campbell into a great save. Houston wasted no time in the second half doubling their lead. Just three minutes in, Sofia Huerta sent in a great ball from the right flank to Veronica Latsko, who had plenty of space to bounce a header down and past Sheridan. Six minutes later, Imani Dorsey, who was one of Sky Blue’s most active and dangerous all night, persisted with her efforts inside Houston’s box until she stripped Amber Brooks of the ball, beating an unprepared Campbell at close range to cut Houston’s lead in half. For a while, it looked like Sky Blue would make a game of it, forcing Houston to put in work to keep their playoff hopes alive. Lloyd and Dorsey, helped by Shea Groom kept the Dash honest in an end to end battle. However, in the 67th minute, the Dash scored again, and this time there was no looking back. Kealia Ohai sent in a cross that was dangerously close to the net, and Sheridan made the decision to push it away with one hand. This left her on the ground as the ball bounced fortuitously to Huerta, who finished with a half-volley at a very difficult angle after having several chances on the night. Just two minutes later, Huerta drew a penalty after being taken down from behind in the box by Madison Tiernan. Rachel Daly stepped up and buried it from the spot for her tenth goal of the season. Action immediately went to the other end, where Lloyd sent a free kick just over the bar after Amber Brooks fouled Groom just outside the box. After a series of subs, including the professional debut of Amandine Pierre-Louis, and two very close chances from Thembi Kgatlana and Ohai, the Dash pounced again in the 88th minute. Kyah Simon took a corner kick that went directly to Haley Hanson, who one-timed it into the back of the net as she was heading away from the goal, finding space just on top of the six-yard box. This was also Hanson’s first NWSL goal. In rapid succession, Savannah McCaskill forced Campbell into an excellent save and earned a corner. The Dash cleared the corner on the first opportunity and sent it long for Kgatlana, who dribbled half the distance of the field, separated herself from Amanda Frisbie, and launched the ball past Sheridan. Despite the win, Houston did not get the help they needed from other teams and have been eliminated from the playoffs. In sixth place at 9-9-5, they’ll wrap up their season in the very last game of the NWSL regular season on September 8 in North Carolina. Sky Blue, in ninth place at 0-16-5, next plays Washington on September 1. The Portland Thorns played the role of party pooper in Washington D.C. as the Spirit’s first ever game at Audi Field ended in defeat thanks to a solitary goal from Tobin Heath. The goal came in the 15th minute from the United States international and condemned the Spirit to their 17th defeat of the season and their tenth in a row – with both numbers being new NWSL records. There was little to separate the two teams in the opening ten minutes, with neither keeper worked – Andi Sullivan’s driven effort from 25 yards the only shot of note after nine minutes, and that failed to trouble Adrianna Franch in the Thorns; goal. The Thorns looked to utilize their pace down the sides, and in the 15th they took the lead through a brilliant strike from Tobin Heath. Australian Hayley Raso was given acres of space down the right-hand side, and she took full advantage, crossing into the box and finding Heath, who shifted the ball onto her left foot and unleashed an effort into the roof of the net past Spirit keeper, Aubrey Bledsoe. Lindsey Horan almost made it two four minutes later when her threat in the air was again on show as she met a Heath cross in the box, but headed just wide after good pressure from Bledsoe. Heath again went close on 25 minutes but was denied by Bledsoe, before Rose Lavelle registered the Spirit’s first effort on target, cutting in on her left foot down the right-hand side, before firing a shot that stung the palms of Franch, but was parried to safety. Spirit’s Havana Saloun and Portland’s Celeste Boureille traded efforts that flew over the cross bar in the final five minutes of the half, but in truth, neither keeper was overworked in the opening 45-minute period. The second half started with the Thorns on the front foot and despite a tame long-range effort from Andi Sullivan for the Spirit, it was the North-West Coast club that looked most likely to extend their lead. Some nice build up play between Heath and Ana Crnogorgevic saw the ball eventually laid off to Horan six minutes into the second half, but she couldn’t keep her effort down as she blasted the ball over Bledsoe’s crossbar. The Thorns were dealt a blow shortly before the hour mark when winger Raso was carried off on a stretcher after an accidental collision with Bledsoe. Moments later, Horan almost doubled her side’s lead with a header, but Sullivan was there to clear off the line. Heath continued to pull the strings in midfield and it was her neat play that set sub Caitlin Foord off down the left. She clipped a cross into the near past, and Crnogorgevic was there to meet it, but Bledsoe was there to block her close-range header. The Spirit created little in trying to get back into the game, but sub Caprice Dydasco was able to get off a shot after a rare counterattack, but her right-footed effort skimmed the top of the net from distance on 72 minutes. The fitness of Spirit stars Lavelle and Mal Pugh are clearly still an issue for the home side as interim coach Tom Torres replaced both in the final 13 minutes of the match, that despite their search for a leveler. That leveler never came, and the Thorns hung on to claim their 11th win of the season and move to 11-6-6 (39 pts), with the Spirit slipping to 2-17-4 (10 pts). The DC club will be hoping to end their rotten run when they face Sky Blue next Saturday in their final match of the season, while Portland will claim home field advantage in the playoffs if they beat Seattle on September 7th at Providence Park. The Seattle Reign FC were at least temporarily thwarted from clinching a home semifinal after a stoppage-time equalizing goal from the North Carolina Courage’s Lynn Williams sent the game to a 1-1 finish. Both goals were scored off of corner kicks, with Theresa Nielsen scoring the lone Seattle goal earlier in the second half. The top two teams in the league battled through a scoreless first half, but that was largely thanks to Reign goalkeeper Lydia Williams, who made six saves in the opening 45 minutes to prevent the Courage from gaining a first-half lead. In all, Williams finished the day with 11 saves, but it was her inability to tally a 12th save that sent the match to a draw. In the fifth minute of second-half stoppage time, Courage defender Abby Dahlkemper sent in the corner kick that was headed diagonally in front of goal by Abby Erceg before being headed on frame by Kristen Hamilton. Williams made the diving one-handed save to deny Hamilton’s chance, but the deflection was headed back towards goal by Sam Mewis. Mewis’s shot was then blocked by the Seattle defense, but they were unable to clear the ball from danger, allowing McCall Zerboni to chance a shot that was again deflected, this time to Lynn Williams. Williams bounced her shot off the inside of the post, but it took a North Carolina deflection and bounced in for the last-minute equalizer. It was a dramatic end to a match that looked all but wrapped up in favor of Seattle following their 67th minute goal by Nielsen. Jess Fishlock sent in a long corner kick, which Nielsen got on the end of with her head to redirect it towards goal. Courage goalkeeper Katelyn Rowland came off her line in attempts of collecting Nielsen’s shot, but Jodie Taylor shielded Rowland from the ball, allowing Nielsen’s shot to bounce past the keeper and across the goal-line for her first goal of the season. A successful set piece for Seattle! @ReignFC goes up 1–0 at home thanks to @NielsenTheresa8. The Reign can still lock down the No. 2 spot on the NWSL table with a draw or loss by the Portland Thorns FC later tonight, or by earning a win in their next match when they take on the Thorns in Portland on Friday, September 7. The back-to-back Shield-winning Courage will next close out their 2018 regular season with a home match against the Houston Dash on Saturday, September 8.